Paradise is a garden...but heaven is a city. From the acclaimed author of Take This Bread and Jesus Freak comes a powerful new account of venturing beyond the borders of religion into the unpredictable territory of faith. On Ash Wednesday, 2012, Sara Miles and her friends left their church buildings and carried ashes to the buzzing city streets: the crowded dollar stores, beauty shops, hospital waiting rooms, street corners and fast-food joints of her neighborhood. They marked the foreheads of neighbors and strangers, sharing blessings with waitresses and drunks, believers and doubters alike. CITY OF GOD narrates the events of the day in vivid detail, exploring the profound implications of touching strangers with a reminder of common mortality. As the story unfolds, Sara Miles also reflects on life in her city over the last two decades, where the people of God suffer and rejoice, building community amid the grit and beauty of this urban landscape. 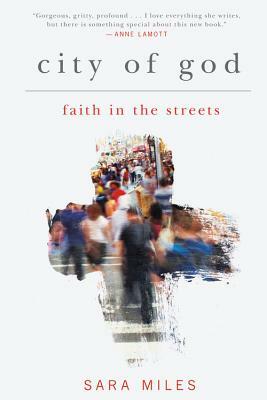 CITY OF GOD is a beautifully written personal narrative, rich in complex, real-life characters, and full of the "wild, funny, joyful, raucous, reverent" moments of struggle and faith that have made Miles one of the most enthralling Christian writers of our time. Sara Miles is the founder and director of The Food Pantry, and Director of Ministry at St. Gregory of Nyssa Episcopal Church in San Francisco. She is the author of Take This Bread: A Radical Conversion and Jesus Freak: Feeding Healing Raising the Dead. Her work has appeared in The New York Times Magazine, The New Yorker, Salon, and NPR. She lives in San Francisco.